My favorite attractions are those that don’t have a red rope to keep you away from the exhibits, ones that let you completely immerse yourself in the past (as good museums should!). 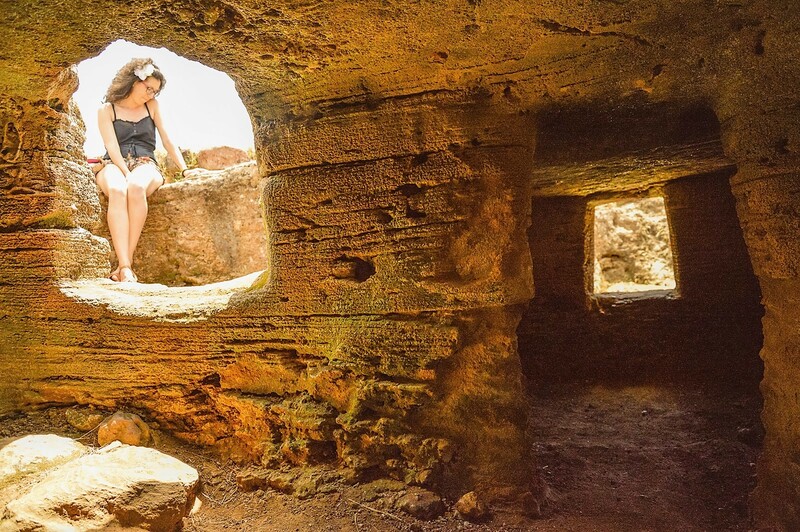 If you visit this next stunning place, you’ll not only see 5000-plus-year-old underground rock tombs, but will be able to enter and explore them from the inside. There are hundreds of small tombs around the Italian island of Sardinia, which the locals believed to be houses of fairies (domus de janas in Sardinian). They simply couldn’t think of any other explanation for the peculiar formations they found all over the island. 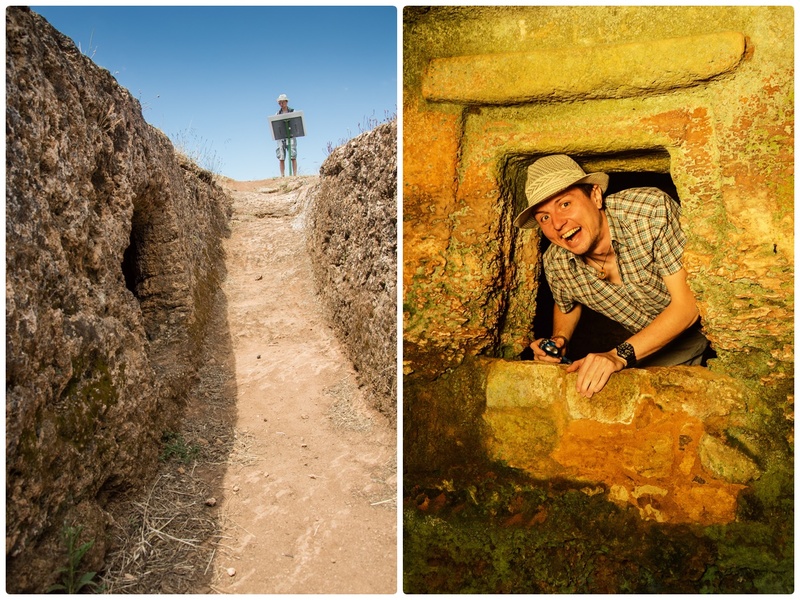 One of the most impressive places to admire these structures is the Necropolis of Anghelu Ruju, with 38 rock-hewn tombs that look like small houses, featuring windows, doors and rooms linked together with tunnels. The most amazing thing about these rock tombs is that they weren’t carved with metal instruments but with other pieces of rock. The people of that time (from the local Ozieri cultures) found a type of rock that was harder than the one they had to excavate and, considering the limited tools they had to work with, performed an amazing feat of artistry. In some of the tombs you’ll see engraved images of bulls with horns – a symbol of the male god in Ozieri cultures. Examine the walls for traces of ocher – the color of rebirth – to make sure this is not your last life on earth. Some of the tombs are linked to each other with windows, while others are accessible by staircases leading underground. The entrances are sometimes narrow, but it’s not impossible to squeeze in. Once you’re inside, you’ll feel like a prehistoric man or a fairy in your own magical domain. While building a house in 1903, workers came across a human skull and an ancient vessel. Further excavations revealed 38 underground tombs – with both mass and single graves. 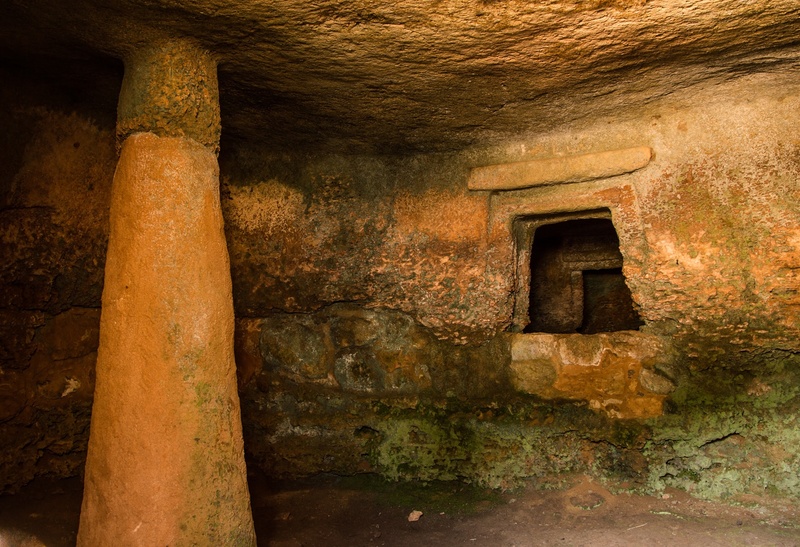 The prehistoric Ozieri culture, whose people created these tombs, was dominant in Sardinia between 3200-2700 BC. Add some local wine to the trip! Less than a mile (1.6 km) down the road there is a winery – Vigneti Sella & Mosca – where you can taste and buy wine made from local varietals, including Vermentino, Torbato, Cannonau, Carignano and Monica. It’s best to book your tasting session in advance. The easiest way to visit Anghelu Ruju is by car, as there’s no public transportation to get you there. The historic site is located 6 miles (10 km) from Alghero and 2.5 miles (4 km) from the local airport. An entrance ticket costs 3.50 euros. Opening hours: from 1 November to 31 March: 10 am – 2 pm. From 1 May to 30 September: 9 am – 7 pm. April and October: 9 am – 6 pm. Other large domus de janas include Montessu, near Villaperuccio, and Sant’Andrea Priu in Bonorva.